Long-distance walking is appropriate for a trek in the Himalayas, not for getting around Vegas. Instead, make use of the Las Vegas monorail and trams. We bet you didn't even know these cool train-like transport systems existed outside of Disneyland and Springfield. Well, they do. And they make getting up and down the Las Vegas Strip a whiz. 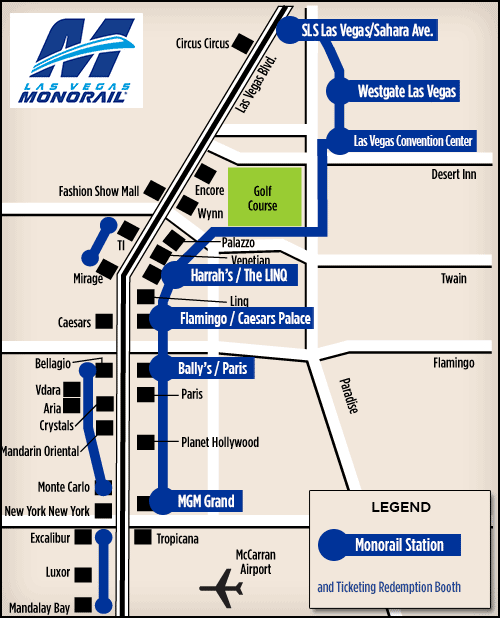 Monorail Las Vegas runs from the MGM Grand to SLS Las Vegas. The route has seven stations: MGM Grand, Bally's / Paris, Flamingo, Harrah's / The LINQ, Las Vegas Convention Center, Westgate Las Vegas and SLS Las Vegas. Monorail Las Vegas is open Monday, 7 a.m. - midnight; Tuesday - Thursday, 7 a.m. - 2 a.m.; Friday - Sunday, 7 a.m. - 3 a.m. Rates for the monorail start at $13 for an unlimited one-day pass for one person. Multiple-day pass options are also available. The Mirage-Treasure Island tram runs between 7 a.m. - 2 a.m., daily. The tram arrives just about every 15 minutes and the ride lasts about two to four minutes. The Mirage stop of the Las Vegas Monorail is outside but well shaded with a misting system, and located just to the left of the hotel's front entrance. At Treasure Island, passengers wait indoors in a corridor located near the entrance to the parking garage. Those waiting for the tram stand behind automatic gates. Because the automatic gates tend to open almost as soon as the tram arrives, it is best to allow everyone on the tram a chance to disembark first before getting on. The waiting areas, as well as the tram itself, have televisions playing ads that feature TI and Mirage shows and attractions. The track is set back from the Strip and the ride is smooth, passing palm trees and vegetation. It also offers a nice aerial view of the TI pool on the west side. Seating is bus-style, with long benches and some standing room. The Bellagio - CityCenter - Park MGM tram runs daily from 8 a.m. - 4 a.m., every seven minutes. The tram arrives just about every 15 minutes and the ride lasts about two to six minutes. The tram stops at Crystals and again you'll be outside but within a shelter. From this stop riders can go downstairs into the mall. The tram's final stop is the Park MGM. The tram's exit is at the Park MGM's Street of Dreams shopping center. There is also an entrance to Aria accessible from this stop. It will lead you to the front portion of Aria's casino. This route on the Las Vegas Monorail varies based on what hotel you start at. If you start at the Excalibur main station, the monorail will take you directly to Mandalay Bay - about a 3-minutes trip. If you start from Mandalay Bay, you will stop at the Luxor and then the Excalibur - about a 7-minutes trip. The express tram runs daily from 9 a.m. to 10:30 p.m., and trains leave every 3-7 minutes. The all-stops tram runs from 11 a.m. - 10:30 p.m.
All waiting areas are indoors or covered except the Luxor's, but some walking is required to make the loop (there are stairs as well as an elevator to access the tram stop). Fortunately, everything is well air-conditioned. Small platforms and a lack of any attendants at the Mandalay Bay end mean you may have to scramble to a car when traffic is heavy, but even a holiday weekend crowd can be accommodated once the initial rush for a seat dies down. Although it's a little more complicated to make this loop, the profusion of stations has some advantages: The Main Station is convenient to a free pull on a slot machine with a $5,000 payoff (though it gives out many more free show tickets), and the Luxor's is the only monorail stop with music for waiting passengers.